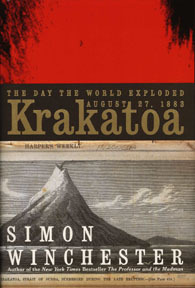 In Krakatoa, Simon Winchester, author of The Professor and the Madman (the story of the Oxford English Dictionary), tells the story of the most cataclysmic volcanic eruption in recorded human history, the explosion of the island of Krakatoa off the coast of Java on August 27, 1883. The sound of the islands destruction was heard in Australia and India, thoudands of miles away. The immense tsunami (tidal wave) that followed killed nearly forty thousand people. Dust from the eruption swirled around the planet in the upper atmosphere for years, causing temperatures worldwide to plummet and crops to fail as far way as Britain. I had not realized until reading Winchesters book that the aftermath of the eruption triggered a wave of anti-Western feeling among fundamentalist Muslims, leading to an outbreak of murderous Islamic-inspired killing — an erie resonance with todays post- 911 world.